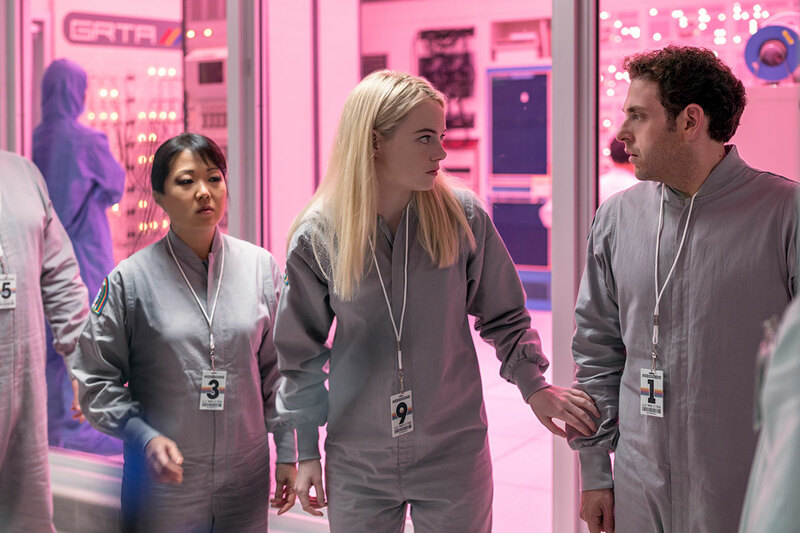 Recently launched Netflix title Maniac has made an impact across Europe after its premiere on September 21. The Emma Stone and Jonah Hill-starring dark comedy has made an impression on Parrot Analytics top lists across Europe, which measures audience demand via ‘expressions’ such as file-sharing and social media posts. The title was the most demanded across Germany and Italy, drawing 3.9m and 3.1m demand expressions, respectively. 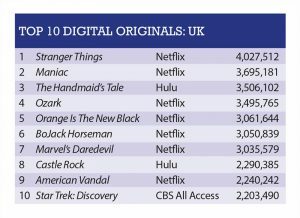 It also arrived in second place on the UK’s digital demand list and fifth in Spain’s, amassing 3.7m and 2.1m demand expressions respectively. It appeared in the top lists across France, the UK, Germany, Italy and Spain. In the UK, the top most demanded digital original series is Stranger Things, as viewers anticipate the third series of the sci-fi title. The title gathered 4m demand expressions, with Maniac coming in second and The Handmaid’s Tale drawing 3.5m expressions. Continuing titles that are due for new seasons rank highly on Parrot’s UK digital list. 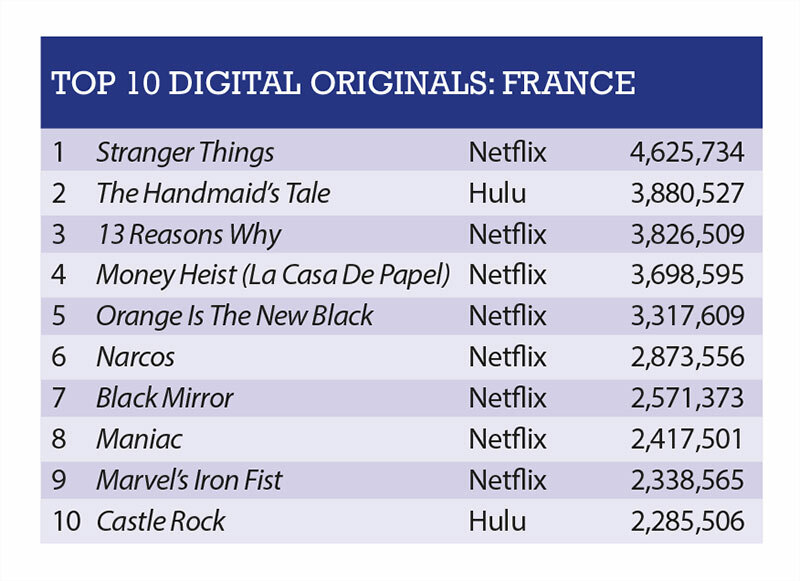 American Vandal arrived in ninth place on the list with 2.2m demand expressions and Ozark arrived in fourth place with 3.5m expressions after their second season premieres over the summer. In the UK’s overall demand list, which measures expressions across broadcast and streaming platforms, Bodyguard unsurprisingly made an appearance in sixth place drawing 5.2m demand expressions. 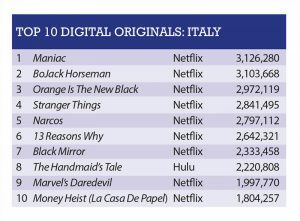 Newcomer to the UK Killing Eve also takes a place in the top ten, arriving in eighth place with near 4.8 demand expressions. American Horror Story topped the list after the return of its eighth season this September. It drew 8.3m demand expressions. 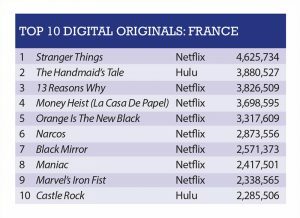 Stranger Things also topped the digital list in France, drawing 4.6m demand expressions. Although it proved to be more traditionalist than its UK counterpart, with the top titles continuing to be popular titles such as The Handmaid’s Tale, 13 Reasons Why and Orange is the New Black. Newcomers Maniac and Castle Rock appeared at the bottom of the list, in eighth and tenth place respectively. France’s top overall title is Grey’s Anatomy, which drew 8.3m demand expressions. It is followed by commonly demanded titles The Walking Dead and Game of Thrones, which arrive in second and third place on the list. Some unexpected titles do make an appearance, however. Japanese anime title My Hero Academia is ranked in fifth place and French title Touche Pas À Mon Poste! arrives in eighth spot. 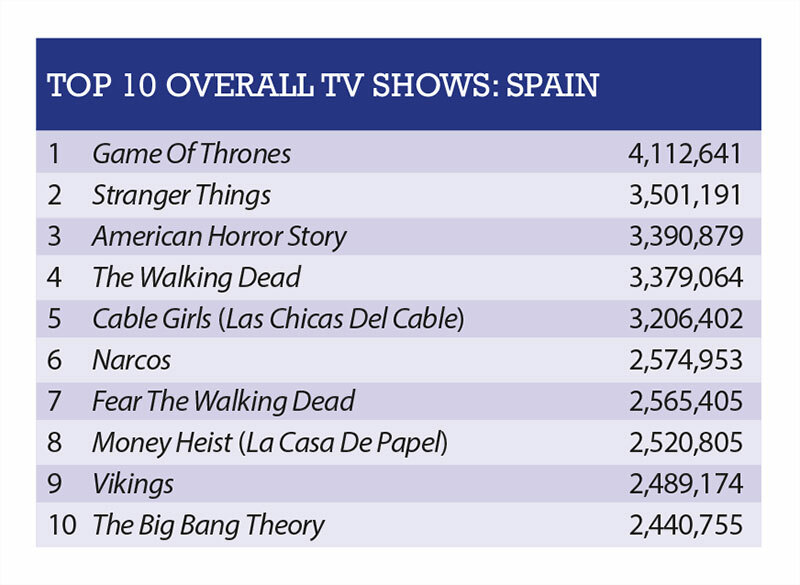 Unsurprisingly, Spanish originals have a strong presence across the country’s digital and overall rankings. Las Chicas Del Cable (Cable Girls), La Casa De Papel (Money Heist) and La Casa De Las Flores (The House of Flowers) rank second, fourth and seventh place in its digital list. La Chicas Del Cable and La Casa De Papel also appear in fifth and eighth place in the overall list. 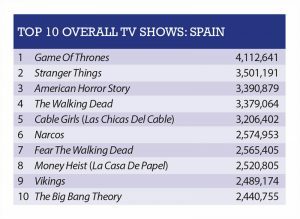 Stranger Things ranks highly again, coming in first place on Spain’s digital list and second on its overall list. New season returners American Vandal and American Horror Story prove popular yet again, both taking a place on Spain’s top lists. 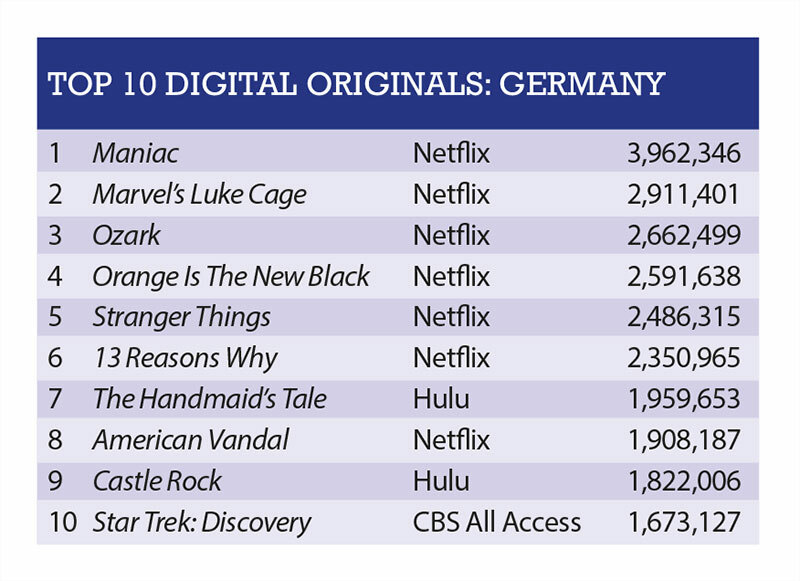 American drama largely dominate Germany’s overall list, with The Walking Dead coming in as the most in-demand title for the territory. Game of Thrones, Grey’s Anatomy and American Horror Story follow in second, third and fourth place on the list. 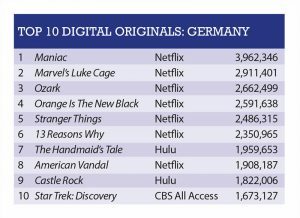 Beta Film’s Babylon Berlin and The Flash only appear in rankings in Germany, in ninth and tenth place. Maniac led the way in the digital ranking, coming up top with near 4m demand expressions. Other favourites are season returners such as Marvel’s Luke Cage,Ozark and Orange is the New Black. 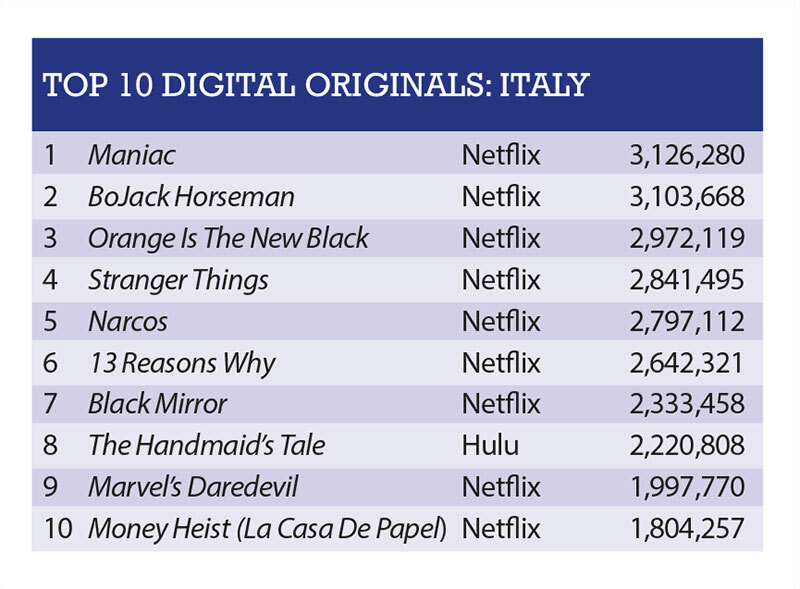 BoJack Horseman makes an unsuspected entry in Italy’s digital list, coming in second with 3.1m demand expressions. The list is topped by Maniac which drew 3.1m demand expressions. The majority of the titles on the digital list are season returners such as 13 Reasons Why, Black Mirror, Narcos and The Handmaid’s Tale. Italian titles such as X Factor: Italia and Uomini E Donne made an appearance on the country’s overall list, coming in second and fifth place. Grey’s Anatomy led the list with 7.3m demand expressions. Source and methodology: Parrot Analytics assesses demand for popular shows through various ‘demand expression platforms’ including social-media and photo-sharing platforms such as Facebook and Instagram, blogging and microblogging platforms such as Tumblr, wikis and informational sites, peer-to-peer protocols and file-sharing platforms. Parrot’s artificial-intelligence systems assess billions of data points to reach the overall demand rating.